"Boat anchor" redirects here. For the metaphor, see Boat anchor (metaphor). For other uses, see Anchor (disambiguation). A sea anchor is a drogue, not in contact with the seabed. It is used to control a drifting vessel, or to limit the speed of a sailing yacht running "under bare poles" in a storm. Anchors achieve holding power either by "hooking" into the seabed, or sheer mass, or a combination of the two. Permanent moorings use large masses (commonly a block or slab of concrete) resting on the seabed. Semi-permanent mooring anchors (such as mushroom anchors) and large ship's anchors derive a significant portion of their holding power from their mass, while also hooking or embedding in the bottom. Modern anchors for smaller vessels have metal flukes which hook on to rocks on the bottom or bury themselves in soft seabed. The vessel is attached to the anchor by the rode (commonly called cable when made of rope, and made of chain in larger vessels), or a combination of these. The ratio of the length of rode to the water depth is known as the scope; generally, the rode should be between 5 and 10 times the depth of the seabed, giving a scope of 5:1 or 10:1; the larger the number, the shallower the angle is between the cable and the seafloor, and the less upwards force is acting on the anchor. A 10:1 scope gives the greatest holding power, but also allows for much more drifting due to the longer amount of cable paid out. Anchoring with sufficient scope and/or heavy chain rode brings the direction of strain close to parallel with the seabed. This is particularly important for light, modern anchors designed to bury in the bottom, where scopes of 5:1 to 7:1 are common, whereas heavy anchors and moorings can use a scope of 3:1, or less. Some modern anchors, such as the Ultra will hold with a scope of 3:1; but, unless the anchorage is crowded, a longer scope will always reduce shock stresses. Since all anchors that embed themselves in the bottom require the strain to be along the seabed, anchors can be broken out of the bottom by shortening the rope until the vessel is directly above the anchor; at this point the anchor chain is "up and down", in naval parlance. If necessary, motoring slowly around the location of the anchor also helps dislodge it. Anchors are sometimes fitted with a tripping line attached to the crown, by which they can be unhooked from rocks or coral. The term aweigh describes an anchor when it is hanging on the rope and is not resting on the bottom. This is linked to the term to weigh anchor, meaning to lift the anchor from the sea bed, allowing the ship or boat to move. An anchor is described as aweigh when it has been broken out of the bottom and is being hauled up to be stowed. Aweigh should not be confused with under way, which describes a vessel which is not moored to a dock or anchored, whether or not the vessel is moving through the water. The earliest anchors were probably rocks, and many rock anchors have been found dating from at least the Bronze Age. Pre-European Maori waka (canoes) used one or more hollowed stones, tied with flax ropes, as anchors. Many modern moorings still rely on a large rock as the primary element of their design. However, using pure mass to resist the forces of a storm only works well as a permanent mooring; a large enough rock would be nearly impossible to move to a new location. The ancient Greeks used baskets of stones, large sacks filled with sand, and wooden logs filled with lead. 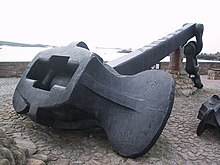 According to Apollonius Rhodius and Stephen of Byzantium, anchors were formed of stone, and Athenaeus states that they were also sometimes made of wood. Such anchors held the vessel merely by their weight and by their friction along the bottom. Iron was afterwards introduced for the construction of anchors, and an improvement was made by forming them with teeth, or "flukes", to fasten themselves into the bottom. This is the iconic anchor shape most familiar to non-sailors. This form has been used since antiquity. The Roman Nemi ships of the 1st century AD used this form. The Viking Ladby ship (probably 10th century) used a fluked anchor of this type, made entirely of iron. The Admiralty Pattern anchor, or simply "Admiralty", also known as a "Fisherman", consists of a central shank with a ring or shackle for attaching the rode. At the other end of the shank there are two arms, carrying the flukes, while the stock is mounted to the shackle end, at ninety degrees to the arms. When the anchor lands on the bottom, it will generally fall over with the arms parallel to the seabed. As a strain comes onto the rode, the stock will dig into the bottom, canting the anchor until one of the flukes catches and digs into the bottom. The Admiralty Anchor is a reinvention of a classical design, as seen in one of the Nemi ship anchors. This basic design remained unchanged for centuries, with the most significant changes being to the overall proportions, and a move from stocks made of wood to iron stocks in the late 1830s and early 1840s. Since one fluke always protrudes up from the set anchor, there is a great tendency of the rode to foul the anchor as the vessel swings due to wind or current shifts. When this happens, the anchor may be pulled out of the bottom, and in some cases may need to be hauled up to be re-set. In the mid-19th century, numerous modifications were attempted to alleviate these problems, as well as improve holding power, including one-armed mooring anchors. The most successful of these patent anchors, the Trotman Anchor, introduced a pivot where the arms join the shank, allowing the "idle" arm to fold against the shank. Handling and storage of these anchors requires special equipment and procedures. Once the anchor is hauled up to the hawsepipe, the ring end is hoisted up to the end of a timber projecting from the bow known as the cathead. The crown of the anchor is then hauled up with a heavy tackle until one fluke can be hooked over the rail. This is known as "catting and fishing" the anchor. Before dropping the anchor, the fishing process is reversed, and the anchor is dropped from the end of the cathead. 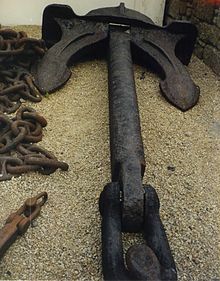 The stockless anchor, patented in England in 1821, represented the first significant departure in anchor design in centuries. Though their holding-power-to-weight ratio is significantly lower than admiralty pattern anchors, their ease of handling and stowage aboard large ships led to almost universal adoption. In contrast to the elaborate stowage procedures for earlier anchors, stockless anchors are simply hauled up until they rest with the shank inside the hawsepipes, and the flukes against the hull (or inside a recess in the hull). While there are numerous variations, stockless anchors consist of a set of heavy flukes connected by a pivot or ball and socket joint to a shank. Cast into the crown of the anchor is a set of tripping palms, projections that drag on the bottom, forcing the main flukes to dig in. Designed by famous yacht designer L. Francis Herreshoff, this is essentially the same pattern as an admiralty anchor, albeit with small diamond shaped flukes or palms. The novelty of the design lay in the means by which it could be broken down into three pieces for stowage. In use, it still presents all the issues of the admiralty pattern anchor. Once popular with cruising yachtsmen, the CQR anchor has been superseded by modern designs. Many manufacturers produce a plough-type anchor, so-named after to its resemblance to an agricultural plough. All such anchors are copied from the original CQR "secure", a 1933 design patented in the UK by mathematician Geoffrey Ingram Taylor. Plough anchors stow conveniently in a roller at the bow, and have been popular with cruising sailors and private boaters. Ploughs are generally good in all types of seafloor, though not exceptional in any. Contrary to popular belief, the CQR's hinged shank is not to allow the anchor to turn with direction changes rather than breaking out, but actually to prevent the shank's weight from disrupting the fluke's orientation while setting. The hinge can wear out and may trap a sailor's fingers. Some later plough anchors have a rigid shank, such as the Lewmar's "Delta". A plough anchor has a fundamental flaw: like it namesake, the agricultural plough, it will dig in but then tends to break out back to the surface. Plough anchors sometimes have difficulty setting at all, and instead skip across the seafloor. By contrast, modern efficient anchors tend to be "spade" types that dig ever deeper. The Delta was developed in the 1980s for commercialization by British marine manufacturer Simpson–Lawrence. It is a plough anchor with a rigid, arched shank. It is described as self-launching because it can be dropped from a bow roller simply by paying out the rode, without manual assistance. American Richard Danforth invented the Danforth pattern in the 1940s for use aboard landing craft. It uses a stock at the crown to which two large flat triangular flukes are attached. The stock is hinged so the flukes can orient toward the bottom (and on some designs may be adjusted for an optimal angle depending on the bottom type). Tripping palms at the crown act to tip the flukes into the seabed. The design is a burying variety, and once well set can develop high resistance. Its lightweight and compact flat design make it easy to retrieve and relatively easy to store; some anchor rollers and hawsepipes can accommodate a fluke-style anchor. The FOB HP anchor designed in Brittany in the 1970s is a Danforth variant designed to give increased holding through its use of rounded flukes setting at a 30° angle. The Fortress is an American aluminum alloy Danforth variant which can be disassembled for storage and it features an adjustable 32° and 45° shank/fluke angle to improve holding capability in common sea bottoms such as hard sand and soft mud. This anchor performed well in a 1989 US Naval Sea Systems Command (NAVSEA) test. and in an August 2014 holding power test that was conducted in the soft mud bottoms of the Chesapeake Bay. This claw-shaped anchor was designed by Peter Bruce from the Isle of Man in the 1970s. Bruce gained his early reputation from the production of large-scale commercial anchors for ships and fixed installations such as oil rigs. The Bruce and its copies, known generically as "claws", have been adopted on smaller boats (partly because they stow easily on a bow roller) but they are most effective in larger sizes. It was intended to address some of the problems of the only general-purpose option then available, the plough. Claw-types do not always quickly in most seabeds, but they have the reputation of not breaking out with tide or wind changes, instead slowly turning in the bottom to align with the force. Bruce anchors can have difficulty penetrating weedy bottoms and grass. They offer a fairly low holding-power-to-weight ratio and generally have to be oversized to compete with newer types. On the other hand, they have a reasonable reputation in boulder seafloors, and they perform relatively well with low rode scopes. They cannot be used with hawsepipes. Many yachtsmen are abandoning the Bruce in favour of more efficient modern anchors, such as the Ultra and the Vulcan. In recent years there has been significant progress in anchor design. Primarily designed to set very quickly, then generate high holding power, these new generation anchors (mostly proprietary inventions still under patent) are becoming popular with users of small to medium-sized vessels. Bügelanker, or Wasi: This German-designed bow anchor has a sharp tip for penetrating weed, and features a roll-bar which allows the correct setting attitude to be achieved without the need for extra weight to be inserted into the tip. Bulwagga: This is a unique design featuring three flukes instead of the usual two. It has performed well in tests by independent sources such as American boating magazine Practical Sailor. Knox Anchor: This is produced in Scotland was invented by Professor John Knox. It has a divided concave large area fluke arrangement and a shank in high tensile steel. A roll bar similar to the Rocna gives fast setting and a holding power of about 40 times anchor weight. Manork: This is a Slovenian design made by Marko Janjanin which has proved successful since 2017. The anchors Manork have been developed for safe anchoring even in the heaviest storms. Its roll-bar is also similar to that of the Bügel. The anchors Marnok have 55 % of their whole weigh on the toe of the fluke (foot). Therefore, the anchor Manork hooks in the seabed even if it is covered with seaweed. Rocna: This New Zealand spade design, available in galvanised or stainless steel, has been produced since 2004. It has a roll-bar (similar to that of the Bügel), a large spade-like fluke area, and a sharp toe for penetrating weed and grass. The Rocna sets very quickly, holds well, and has become the best-selling anchor for yachts and workboats. Spade: This is a French design which has proved successful since 1996. It features a demountable shank (hollow in some instances) and the choice of galvanized steel, stainless steel, or aluminium construction, which means a lighter and more easily stowable anchor. Ultra: This is an innovative spade design that dispenses with a roll-bar. Its main arm is hollow, while the fluke tip has lead within it. Made only in stainless steel, the expensive Ultra is said to perform faultlessly. The Ultra has been very well received, despite its rather high price. Vulcan: A recent sibling to the Rocna, this anchor performs similarly but does not have a roll-bar. Instead the Vulcan has patented design features such as the "V-bulb" and the "Roll Palm" that allow it to dig in deeply. The Vulcan was designed primarily for sailors who had difficulties accommodating the roll-bar Rocna on their bow. Both Vulcans and Rocnas are available in galvanised steel, or in expensive stainless steel. Mud weight: Consists of a blunt heavy weight, usually cast iron or cast lead, that will sink into the mud and resist lateral movement. Suitable only for very soft silt bottoms and in mild conditions. Sizes range between 5 and 20 kg for small craft. Various designs exist and many are home produced from lead or improvised with heavy objects. This is a very commonly used method on the Norfolk Broads in England. These are used where the vessel is permanently or semi-permanently sited, for example in the case of lightvessels or channel marker buoys. The anchor needs to hold the vessel in all weathers, including the most severe storm, but needs to be lifted only occasionally, at most – for example, only if the vessel is to be towed into port for maintenance. An alternative to using an anchor under these circumstances, especially if the anchor need never be lifted at all, may be to use a pile driven into the seabed. Permanent anchors come in a wide range of types and have no standard form. A slab of rock with an iron staple in it to attach a chain to would serve the purpose, as would any dense object of appropriate weight (for instance, an engine block). Modern moorings may be anchored by augers, which look and act very much like oversized screws drilled into the seabed, or by barbed metal beams pounded in (or even driven in with explosives) like pilings, or by a variety of other non-mass means of getting a grip on the bottom. One method of building a mooring is to use three or more conventional anchors laid out with short lengths of chain attached to a swivel, so no matter which direction the vessel moves, one or more anchors will be aligned to resist the force. The mushroom anchor is suitable where the seabed is composed of silt or fine sand. It was invented by Robert Stevenson, for use by an 82-ton converted fishing boat, Pharos, which was used as a lightvessel between 1807 and 1810 near to Bell Rock whilst the lighthouse was being constructed. It was equipped with a 1.5-ton example. It is shaped like an inverted mushroom, the head becoming buried in the silt. A counterweight is often provided at the other end of the shank to lay it down before it becomes buried. A mushroom anchor will normally sink in the silt to the point where it has displaced its own weight in bottom material, thus greatly increasing its holding power. These anchors are only suitable for a silt or mud bottom, since they rely upon suction and cohesion of the bottom material, which rocky or coarse sand bottoms lack. The holding power of this anchor is at best about twice its weight until it becomes buried, when it can be as much as ten times its weight. They are available in sizes from about 5 kg up to several tons. This is an anchor which relies solely on being a heavy weight. It is usually just a large block of concrete or stone at the end of the chain. Its holding power is defined by its weight underwater (i.e. taking its buoyancy into account) regardless of the type of seabed, although suction can increase this if it becomes buried. Consequently, deadweight anchors are used where mushroom anchors are unsuitable, for example in rock, gravel or coarse sand. An advantage of a deadweight anchor over a mushroom is that if it does become dragged, then it continues to provide its original holding force. The disadvantage of using deadweight anchors in conditions where a mushroom anchor could be used is that it needs to be around ten times the weight of the equivalent mushroom anchor. Auger anchors can be used to anchor permanent moorings, floating docks, fish farms, etc. These anchors, which have one or more slightly pitched self-drilling threads, must be screwed into the seabed with the use of a tool, so require access to the bottom, either at low tide or by use of a diver. Hence they can be difficult to install in deep water without special equipment. Weight for weight, augers have a higher holding than other permanent designs, and so can be cheap and relatively easily installed, although difficult to set in extremely soft mud. There is a need in the oil-and-gas industry to resist large anchoring forces when laying pipelines and for drilling vessels. These anchors are installed and removed using a support tug and pennant/pendant wire. Some examples are the Stevin range supplied by Vrijhof Ankers. Large plate anchors such as the Stevmanta are used for permanent moorings. Vessels may carry a number of anchors: bower anchors (formerly known as sheet anchors) are the main anchors used by a vessel and normally carried at the bow of the vessel. A kedge anchor is a light anchor used for warping an anchor, also known as kedging, or more commonly on yachts for mooring quickly or in benign conditions. A stream anchor, which is usually heavier than a kedge anchor, can be used for kedging or warping in addition to temporary mooring and restraining stern movement in tidal conditions or in waters where vessel movement needs to be restricted, such as rivers and channels. A Killick anchor is a small, possibly improvised, anchor. The depth of water is necessary for determining scope, which is the ratio of length of cable to the depth measured from the highest point (usually the anchor roller or bow chock) to the seabed. For example, if the water is 8 metres (26 ft) deep, and the anchor roller is 1 m (3 ft) above the water, the scope is the ratio between the amount of cable let out and 9 m (30 ft). For this reason it is important to have a reliable and accurate method of measuring the depth of water. The anchor rode (or "cable") that connects the anchor to the vessel is made up of chain, sometime with rope ("warp"). Large ships will use only chain rode, whereas, to save weight, smaller boats will use a rope/chain combination. All anchors should have some chain rode; chain is heavy but it resists abrasion from coral, sharp rocks, or shellfish beds, whereas a rope warp is susceptible to abrasion. A combination rode should be arranged so that the rope element should be suspended in the water (and not in contact with the sea bed). Being strong and elastic, nylon rope is very suitable as an anchor warp. Polyester (Terylene) is stronger but less elastic than nylon. Both ropes sink, so they avoid fouling other craft in crowded anchorages and do not absorb much water. Neither breaks down quickly in sunlight. Polypropylene, "polyprop", is not suited to warps as it floats and is much weaker than nylon and barely stronger than natural fibres. Polyprop breaks down in sunlight and becomes hard and unpleasant to handle. Natural fibres such as manila or hemp are still used in developing nations but absorb much water, are relatively weak and rot. They do give good grip and are often very cheap. All anchors should have chain at least equal to the boat's length. Some skippers prefer an all chain warp for added security in coral waters. Boats less than 8 m typically use 6 mm galvanized chain. 8–14 m craft use 9 mm chain and over 14 m use 12 mm chain. The chain should be shackled to the warp through a steel eye or spliced to the chain using a chain splice. The shackle pin should be securely wired. Either galvanized or stainless steel is suitable for eyes and shackles, galvanised steel being the stronger of the two. Larger yachts may add swivels to the rode. These should not be connected to the anchor itself, but should be somewhere in the chain. Most modern stainless steel swivels will pass easily over windlass gypsies and through hawseholes. In moderate conditions the ratio of warp to water depth should be 4:1. In rougher conditions it should be up to twice this with the extra length giving more stretch to resist the anchor breaking out. There is little benefit in having a scope of more than 8:1. The location to drop the anchor should be approached from down wind or down current, whichever is stronger. As the chosen spot is approached, the vessel should be stopped or even beginning to drift back. The anchor should be lowered quickly but under control until it is on the bottom (see anchor windlass). The vessel should continue to drift back, and the cable should be veered out under control so it will be relatively straight. Lowering a concentrated, heavy weight down the anchor line – rope or chain – directly in front of the bow to the seabed behaves like a heavy chain rode and lowers the angle of pull on the anchor. If the weight is suspended off the seabed it acts as a spring or shock absorber to dampen the sudden actions that are normally transmitted to the anchor and can cause it to dislodge and drag. 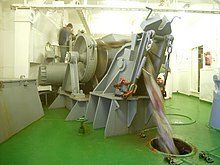 In light conditions, a kellet will reduce the swing of the vessel considerably. In heavier conditions these effects disappear as the rode becomes straightened and the weight ineffective. Known as a "anchor chum weight" or "angel" in the UK. Using two anchors set approximately 45° apart, or wider angles up to 90°, from the bow is a strong mooring for facing into strong winds. To set anchors in this way, first one anchor is set in the normal fashion. Then, taking in on the first cable as the boat is motored into the wind and letting slack while drifting back, a second anchor is set approximately a half-scope away from the first on a line perpendicular to the wind. After this second anchor is set, the scope on the first is taken up until the vessel is lying between the two anchors and the load is taken equally on each cable. This moor also to some degree limits the range of a vessel's swing to a narrower oval. Care should be taken that other vessels will not swing down on the boat due to the limited swing range. (Not to be mistaken with the Bahamian moor, below.) In the bow and stern technique, an anchor is set off each the bow and the stern, which can severely limit a vessel's swing range and also align it to steady wind, current or wave conditions. One method of accomplishing this moor is to set a bow anchor normally, then drop back to the limit of the bow cable (or to double the desired scope, e.g. 8:1 if the eventual scope should be 4:1, 10:1 if the eventual scope should be 5:1, etc.) to lower a stern anchor. By taking up on the bow cable the stern anchor can be set. After both anchors are set, tension is taken up on both cables to limit the swing or to align the vessel. The vessel will now swing in the middle of two anchors, which is acceptable in strong reversing currents, but a wind perpendicular to the current may break out the anchors, as they are not aligned for this load. Also known as tandem anchoring, in this technique two anchors are deployed in line with each other, on the same rode. With the foremost anchor reducing the load on the aft-most, this technique can develop great holding power and may be appropriate in "ultimate storm" circumstances. It does not limit swinging range, and might not be suitable in some circumstances. There are complications, and the technique requires careful preparation and a level of skill and experience above that required for a single anchor. Kedging or warping is a technique for moving or turning a ship by using a relatively light anchor. In yachts, a kedge anchor is an anchor carried in addition to the main, or bower anchors, and usually stowed aft. Every yacht should carry at least two anchors – the main or bower anchor and a second lighter kedge anchor. It is used occasionally when it is necessary to limit the turning circle as the yacht swings when it is anchored, such as in a very narrow river or a deep pool in an otherwise shallow area. For ships, a kedge may be dropped while a ship is underway, or carried out in a suitable direction by a tender or ship's boat to enable the ship to be winched off if aground or swung into a particular heading, or even to be held steady against a tidal or other stream. Historically, it was of particular relevance to sailing warships which used them to outmaneuver opponents when the wind had dropped but might be used by any vessel in confined, shoal water to place it in a more desirable position, provided she had enough manpower. Club hauling is an archaic technique. When a vessel is in a narrow channel or on a lee shore so that there is no room to tack the vessel in a conventional manner, an anchor attached to the lee quarter may be dropped from the lee bow. This is deployed when the vessel is head to wind and has lost headway. As the vessel gathers sternway the strain on the cable pivots the vessel around what is now the weather quarter turning the vessel onto the other tack. The anchor is then normally cut away, as it cannot be recovered. An anchor frequently appears on the flags and coats of arms of institutions involved with the sea, both naval and commercial, as well as of port cities and seacoast regions and provinces in various countries. There also exists in heraldry the "Anchored Cross", or Mariner's Cross, a stylized cross in the shape of an anchor. The symbol can be used to signify 'fresh start' or 'hope'. The New Testament refers to the Christian's hope as "an anchor of the soul" (Hebrews 6:19). In 1887, the Delta Gamma Fraternity adopted the anchor as its badge to signify hope. 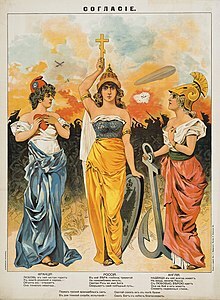 The Mariner's Cross is also referred to as St. Clement's Cross, in reference to the way this saint was martyred (being tied to an anchor and thrown from a boat into the Black Sea in 102). Anchored crosses are occasionally a feature of coats of arms in which context they are referred to by the heraldic terms anchry or ancre. ^ Johnstone, Paul and McGrail, Seán (1989). The sea-craft of prehistory. London: Routledge. ISBN 978-0-415-02635-2, p.82. ^ "anchor" in The New Encyclopædia Britannica. Chicago: Encyclopædia Britannica Inc., 15th edn., 1992, Vol. 1, pp. 377–8. ^ "Grapnel anchor". AceBoater.com. Retrieved 18 May 2016. 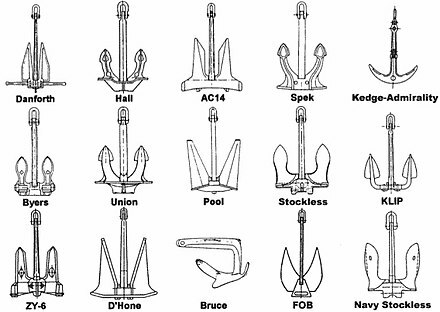 ^ "How to Choose the Right Boat Anchor Types – Active Fisherman". Active Fisherman. 2 January 2015. Retrieved 18 May 2016. ^ Taylor, G. I. (1974). "The history of an invention". Bulletin of the Institute of Mathematics and its Applications. 10: 367–368. Cited by Batchelor, G. K. (1986). "Geoffrey Ingram Taylor, 7 March 1886–27 June 1975". Journal of Fluid Mechanics. 173: 1–14. doi:10.1017/S0022112086001040. ^ Jim Howard; Charles J. Doane (2000). Handbook of Offshore Cruising: The Dream and Reality of Modern Ocean Cruising. Sheridan House, Inc. p. 312. ISBN 978-1-57409-093-2. ^ "Patent EP0990584A1 – Marine anchor of the flat type". google.de. ^ "The Fine Art Of Anchoring". boatus.com. ^ "Performance Comparison". Knox Anchors. Retrieved 10 July 2017. ^ World Wide Words. World Wide Words (30 August 2003). Retrieved on 2013-03-30. ^ Liardet, Francis (1849) Professional Recollections on Points of Seamanship Archived 29 October 2010 at the Wayback Machine, Discipline, &c.
William N. Brady (1864). The Kedge-anchor; Or, Young Sailors' Assistant. First published as The Naval Apprentice's Kedge Anchor. New York, Taylor and Clement, 1841.--The Kedge-anchor; 3rd ed. New York, 1848.--6th ed. New York, 1852.--9th ed. New York, 1857. Wikimedia Commons has media related to Anchor. 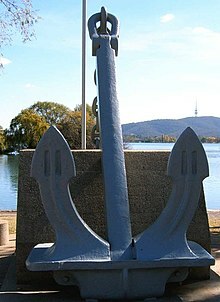 Look up anchor in Wiktionary, the free dictionary.